Each campus has one infant classroom which is licensed by the Ministry of Education to provide programs for up to 10 children from 3 months to 18 months of age. Each classroom is large, bright, and clean, with a large variety of training materials and settings to stimulate the senses of every infant. The classroom includes a dedicated crib for each infant and a small fridge for their formulas. 5 full days per week, 3 full days per week, and 2 full days per week, 9:00 a.m. to 3:30 p.m.
5 days morning per week, 9:00 a.m. to 12:00 p.m. and 5 days afternoon per week, 1:00 p.m. to 3:30 p.m. Morning and afternoon snacks are included. All full day programs also include hot lunches. Extended care hours are available for Parents requiring this assistance. The Before School Extended Care starts from 7:00 a.m. and the After School Extended Care continues to 6:00 p.m.
Our infant programs are designed to create a warm, nurturing, and safe environment where an infant is encouraged to learn, grow, and explore using all of his / her senses. The programs provide a multi-sensory approach with materials and activities scaled to the infant’s size and abilities which are fun and educational. 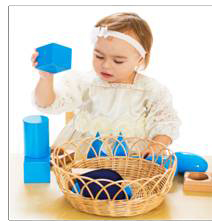 Soft balls and other items will enable the infant to develop fine motor skills and hand-eye coordination. Since movement is critical to brain development, the classroom environment will promote movement, eye / hand co-ordination, and active exploration. In addition to gross motor development, the numerous classroom materials and environment settings will provide the infant abundant opportunities to enhance the perceptual / cognitive development, speech / language development, and personal / social development. Spacious areas provide the infant opportunities to move freely and actively explore their environment. Outdoor play in our large, fenced playground provides the infant opportunities to develop gross motor skills, social interaction, and enjoy the fresh air. Circle Time activities include themes, songs, and movement, giving the infants an opportunity to develop socialization skills and speaking skills. We also provide a daily report to the Parents of each infant, which highlights the child’s daily activities and includes fluid and food intake, a record of diaper changes with details, special activities, etc. At Royal Cachet Montessori Schools, we have the highest standards in programming, teaching methodologies, qualified and caring staff, nutrition, safety, and cleanliness. We will exceed the children’s needs with ease and confidence.